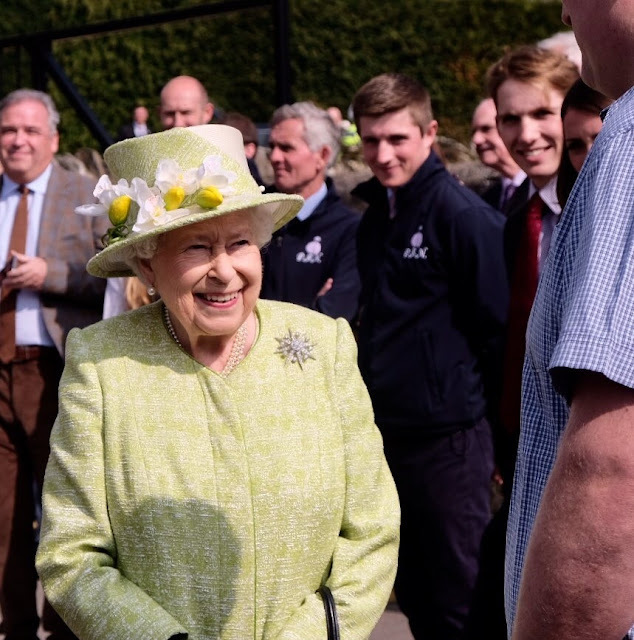 It's Easter and The Queen's 93rd birthday today! She's celebrating by bringing back her old favorite Flower Basket Brooch. Surprisingly, we haven't seen this one since September 2017, the longest period of absence it's had since this site started counting. It picks up both the pinks and the blues in Her Maj's outfit nicely. ...someone has to go for beige (Zara Tindall's got it taken care of), and one can never leave out the lighter shades of blue (The Duchess of Cambridge's repeated Alexander McQueen checks that off, paired with her brooch and wedding earrings - all featuring acorns like her coat of arms). Personally, I loved the floral touch added by Princess Beatrice (perhaps my favorite in Claire Mischevani) and the Wessex ladies, The Countess and Lady Louise. Sometimes those florals really do add the groundbreaking dash of Spring you need. The Queen, accompanied by Princess Eugenie, attended the Royal Maundy Service at St. George's Chapel, Windsor Castle. The Australian Wattle will do very nicely as a recovery from a no brooch weekend, thankyouverymuch Your Maj. The Queen zhuzhed up an existing hat with a little more color and she was joined by Princess Eugenie, who wore a repeated Erdem dress. A pleasing color story for the entire group, wouldn't you say? The Queen attended the Dubai Duty Free Spring Trials Weekend at Newbury Racecourse. You might think this outfit would provide a nice open space for some brooch action, but nope; so far, this coat remains a brooch-free zone. Lace pearl drop gold earrings with garnets and amethysts, given by Lee Hsien Loong, Prime Minister of Singapore. Regular readers will note that one of the most frequently worn official gifts in recent memory came from Singapore in 2012: the Singapore Peranakan Diamond Jubilee Brooch. Another regimental badge for the collection: a hand-made, hand-assembled pin brooch of Canadian gold and precious stones. A handmade silver filigree butterfly brooch with Macedonian rubies. A silver cuff bracelet with an engraved design showing a killer whale, eagle, and wolf, representing the province of British Columbia. Not all jewelry gifts are meant to be worn: The President of South Africa, Cyril Ramaphosa, presented a traditional beaded Zulu necklace, already mounted and framed. 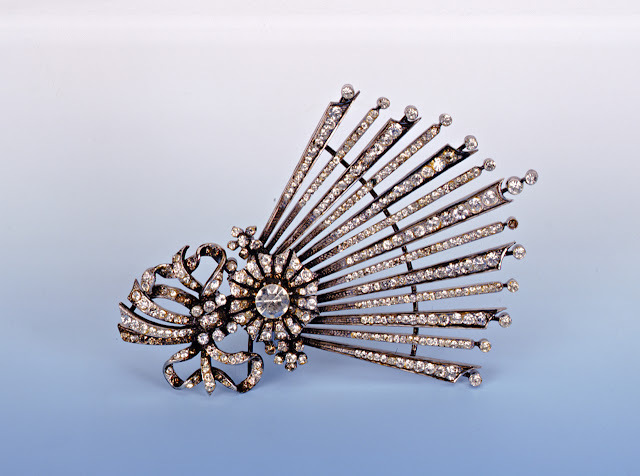 A specially-designed brooch inspired by the aigrette awarded to Horatio Nelson by Sultan Selim III in honor of the Battle of the Nile in 1798. Nelson's aigrette was a chelengk, a military decoration, and it was stolen from the National Maritime Museum in 1951. (Replica below.) This is an interesting gift because another member of the Royal Family already has an adaptation of this piece in her collection: The Duchess of Cornwall wears a diamond version (shown below). A replica of Nelson's stolen diamond chelengk, the piece on which The Queen's new brooch was inspired. The Duchess of Cornwall wearing her Nelson-inspired brooch, which usually makes its appearances at naval events. Jewelry gifts to The Duchess of Cornwall and The Duchess of Cambridge in 2018 were mostly given by individuals, are likely of a smaller nature, and aren't given much description in the lists. The Duchess of Sussex received a few notable pieces. In addition to the numerous congratulatory gifts she and The Duke picked up for their first baby, including dozens of soft toys, she accepted some jewelry from government officials: a brooch from The President of Ireland, a necklace from The First Lady of Fiji, a necklace from The Governor General of New Zealand, and earrings from The Prime Minister of New Zealand. The necklace from Fiji is this strand of colorful pearls from J. 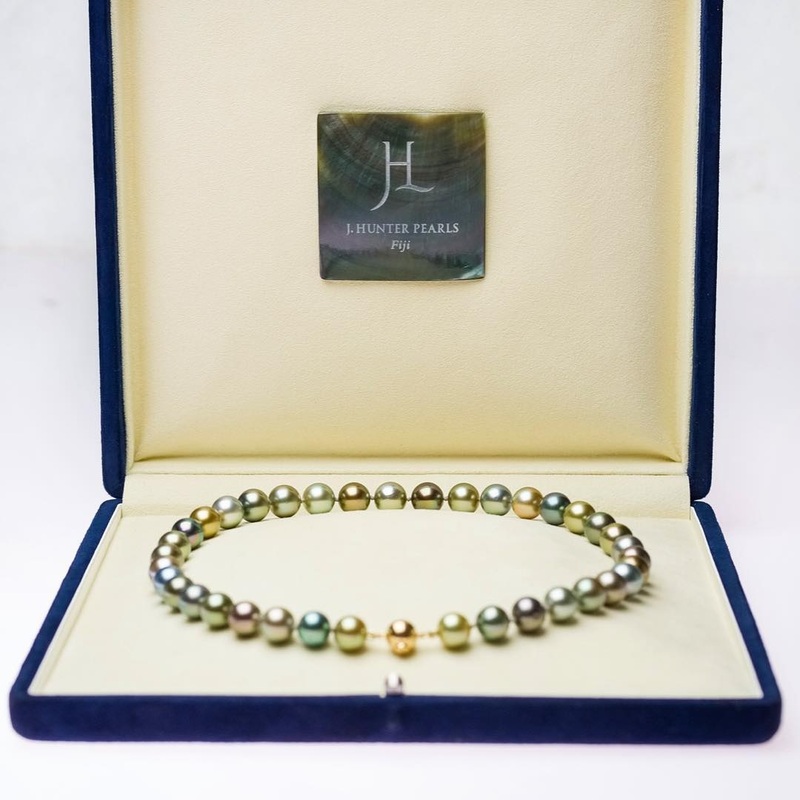 Hunter Pearls, dubbed the Sussex Strand by the company. The Queen often wore gifts of jewels before the end of a visit or tour. In that same vein, The Duchess wore both the necklace received from New Zealand's Governor General, Dame Patsy Reddy, and the earrings she received from the Prime Minister, Jacinda Ardern, during the couple's tour. (She wears both above.) The necklace is a Pounamu Kouma by Māori designer Kiri Nathan, carved by Jason Nathan. The earrings are by New Zealand's Boh Runga. They feature a crossed native Miromiro feather design. In Māori mythology, according to the label, the Miromiro feather was a magic token of devotion that would bring loved ones back to you. 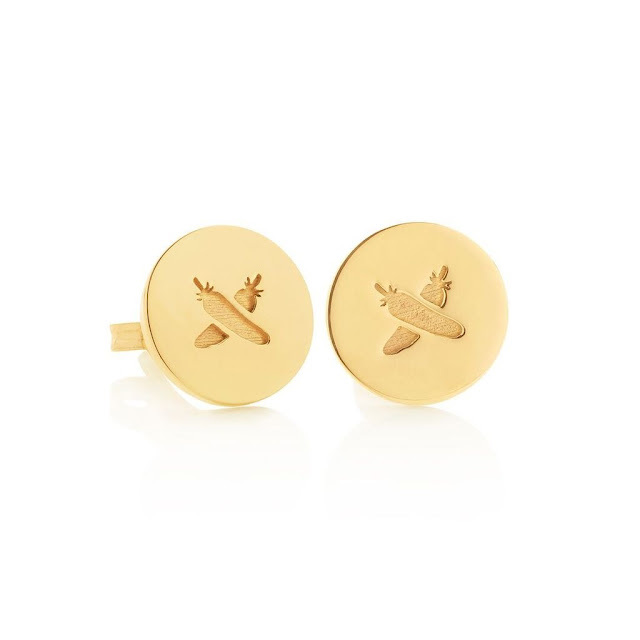 The pieces were a meaningful choice worn after the trip, when The Duke and Duchess visited New Zealand House in London to sign a book of condolence following the terror attack in Christchurch in March. An absolutely perfect use of these sorts of gifts. About official gifts: Official gifts are those received during an official engagement or in connection with an official royal role. These gifts are not the private property of the royal recipient. 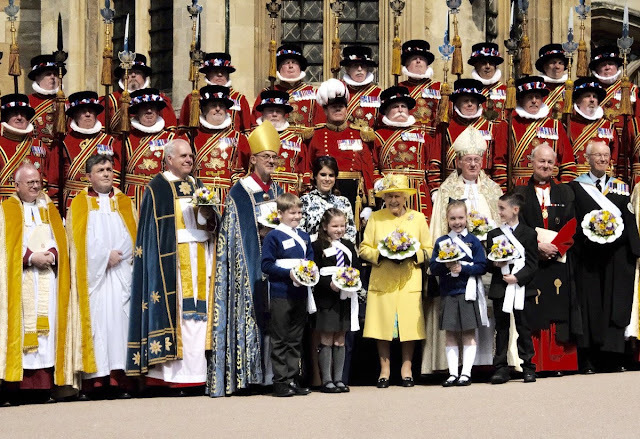 Members of the royal family can use these gifts for their lifetime (and some, depending on the type of gift and its value, can be given to charity or staff or consumed, as in the case of food); on their death, they are passed to the monarch, who will decide if they should become part of the Royal collection or continue to be used by the deceased's successors. The official gift policy was created in 2003 following issues with distribution of gifts; it can be read here. 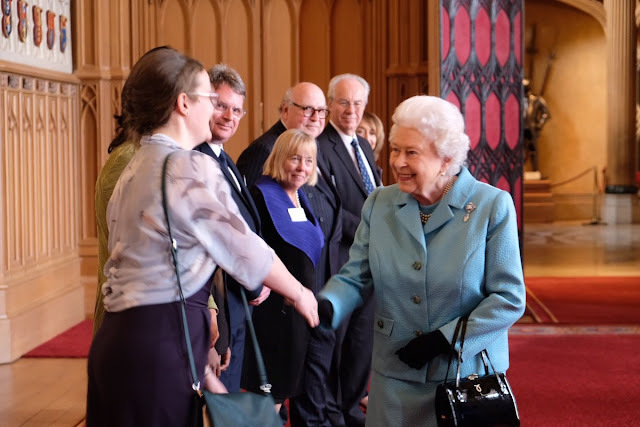 The Queen, Patron, hosted a reception at Windsor Castle in celebration of the centenary of the National Council for Voluntary Organisations. We haven't seen the Cullinan VI and VIII Brooch since 2017. A fun sighting for us and some fun sights for Her Maj's guests at this reception; she welcomed them in the room that holds Princess Eugenie's wedding exhibit. Doesn't get much more Spring-like than this outfit, does it? Her Maj got to meet some horses, we got to see the Jardine Star for the first time this year - all in all, a satisfying away day. March 26: The Queen held audiences at Buckingham Palace. March 27: The Queen held audiences at Buckingham Palace. ...and His Excellency Tarek Adel, Ambassador from the Arab Republic of Egypt, with his wife Mona Said here. 10/10, would like to see this hat at Ascot.